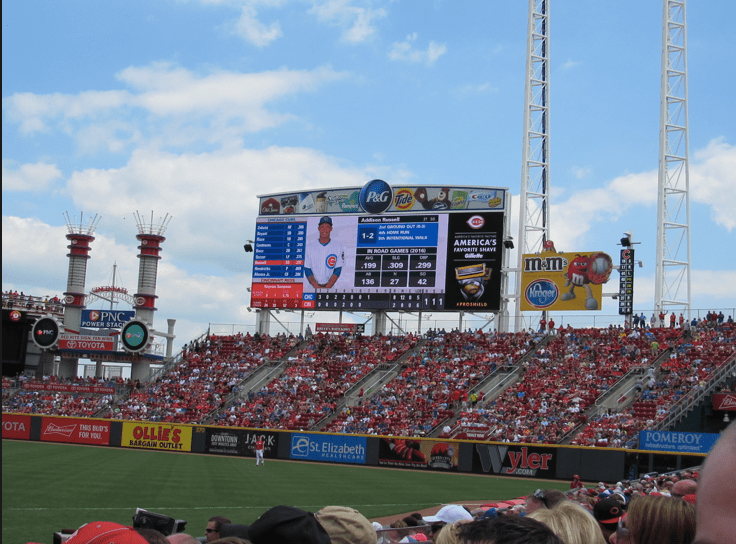 Today I went with three friends to see the Reds host the Cubbies on a getaway day. The Cubs won this game 9-2. The seats and weather were great, and we saw a bunch of cool stuff. It was the first time I’ve made it to a game this season, and I just got a new camera. Click through the jump to see too many photos from today. Ryan Freel’s ex-wife Christie Freel was on-hand before the game for the Red’s community fund. It’s weird to me that a few years prior I was near the exact same seats in this part of the stadium and Freel handed some batting gloves up to some fans. Now he’s gone and his family was on hand in his honor. Life is weird like that. 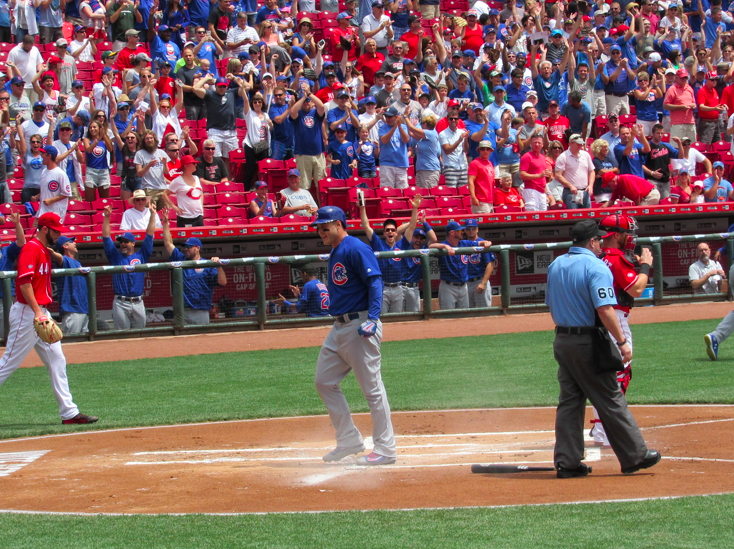 I can always tell my grandkids that I got to see Albert Almora’s first big league home run. 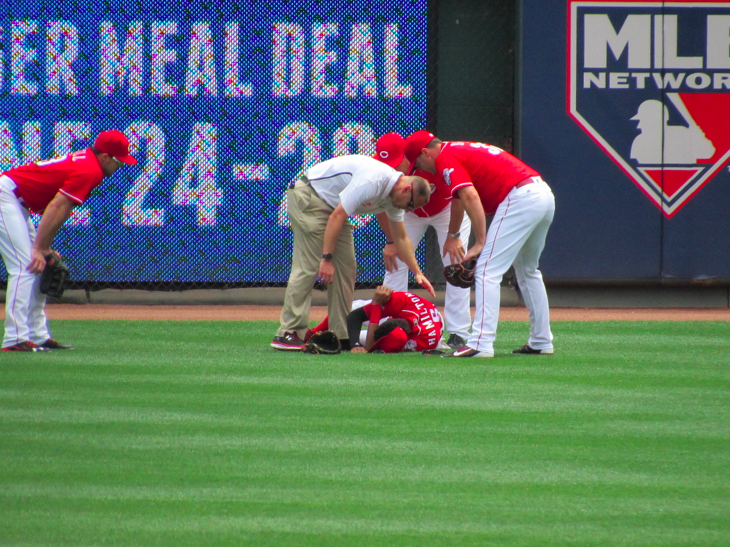 He made a sick catch in centerfield as well. 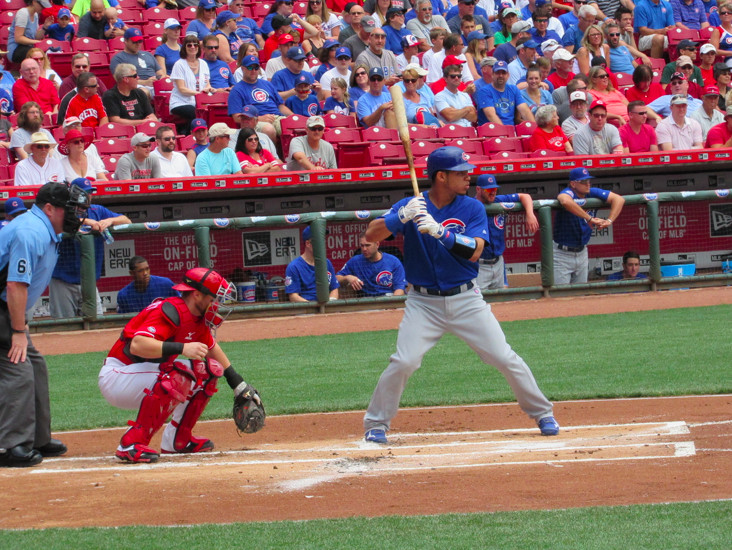 I just thought this was a great shot of Kris Bryant. One of the more professional photos I took today. 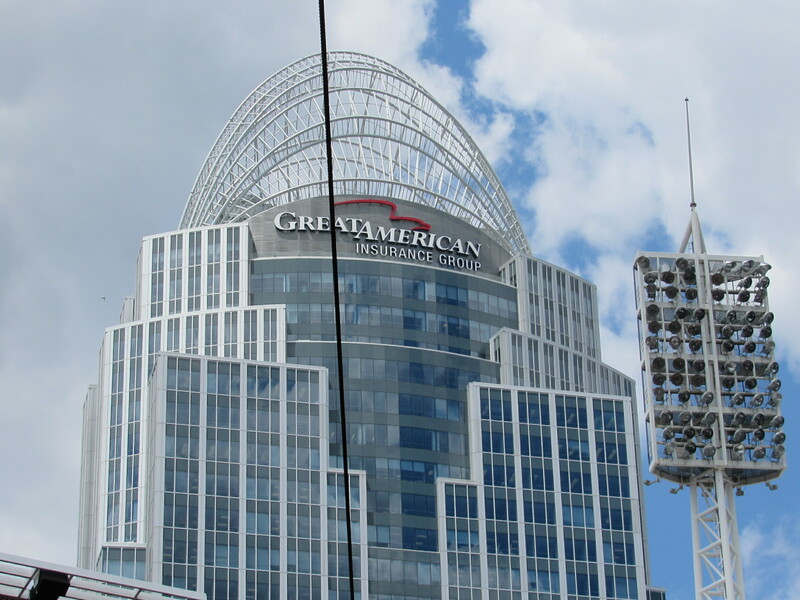 A shot of the Great American Insurance building that overlooks the stadium. It was a beautiful mid-70’s day in Cincinnati. The sun was intense enough to give you a sunburn but there was enough cloud coverage to give you a break here and there. 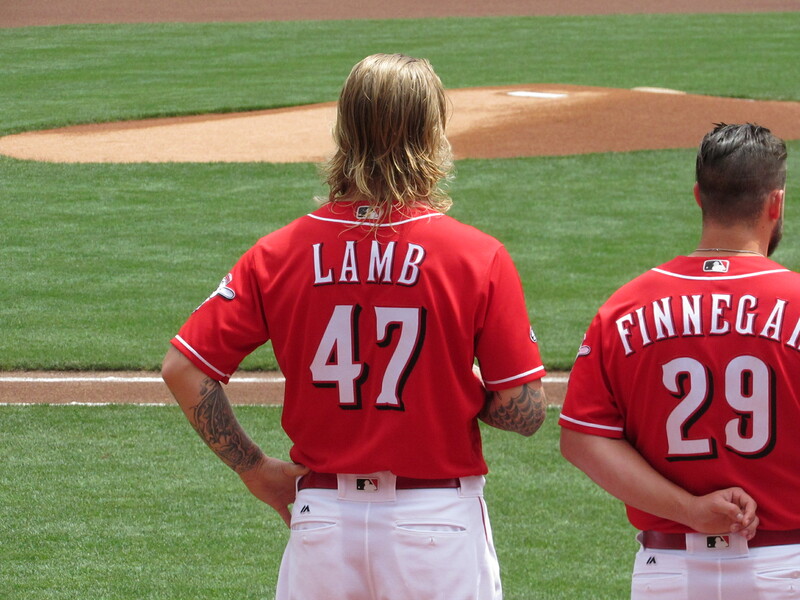 “The Bar-back” Jon Lamb. Greatest nickname we’ve given to a player? I don’t know what’s better. 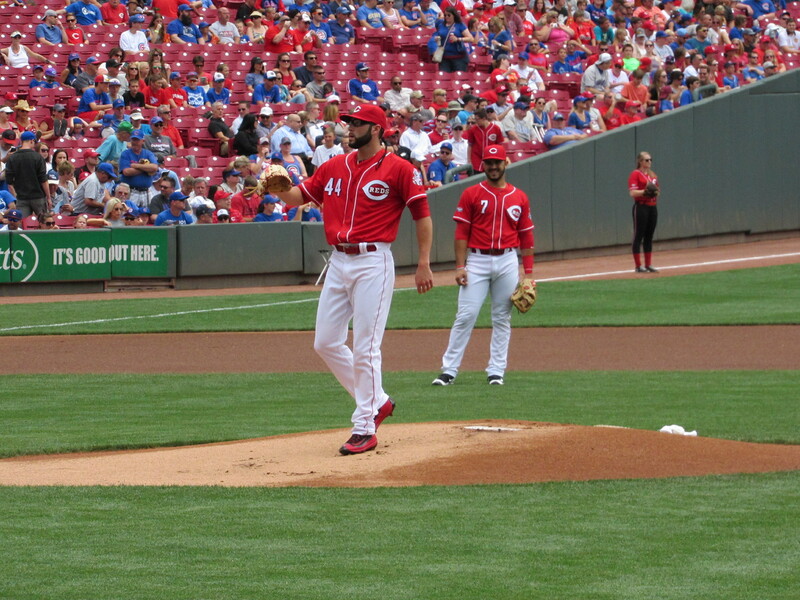 Cody Reed was throwing smoke as the Reds starter, 93-94 on the gun and sported the slider. He got a few strike outs but mostly served batting practice. He just needs more time and possibly a third pitch if he’s going to stick as a starter in the big leagues. But the skills are there. 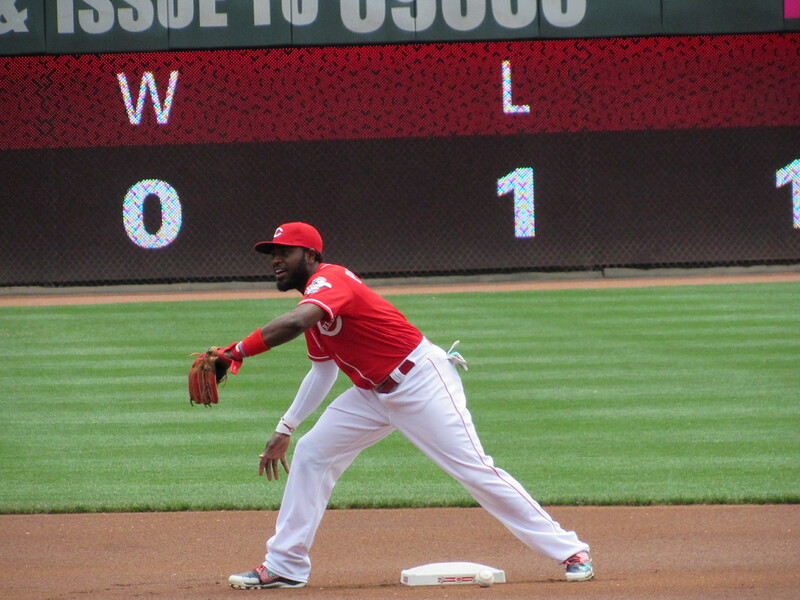 Just the 1,680th big league game in Brandon Phillips’ career, and the 1,545 in a Reds uniform. He made one sick, bare-handed start to a double play. 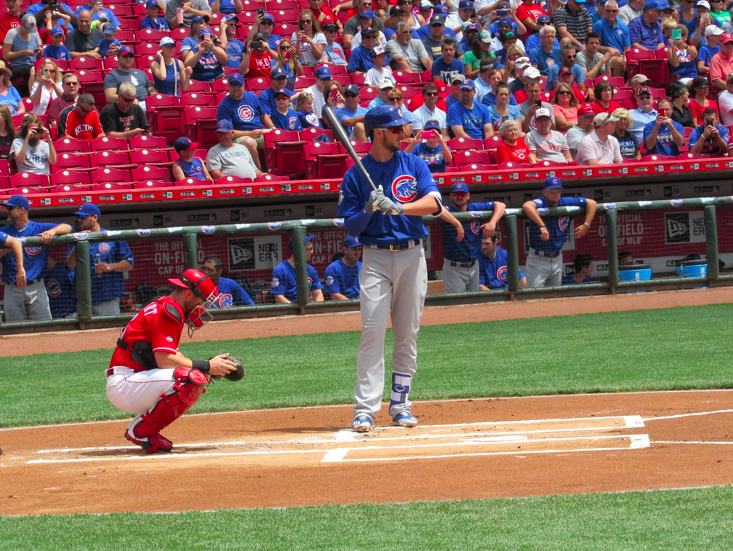 Kris Bryant, the crown jewel of the Cubbies. 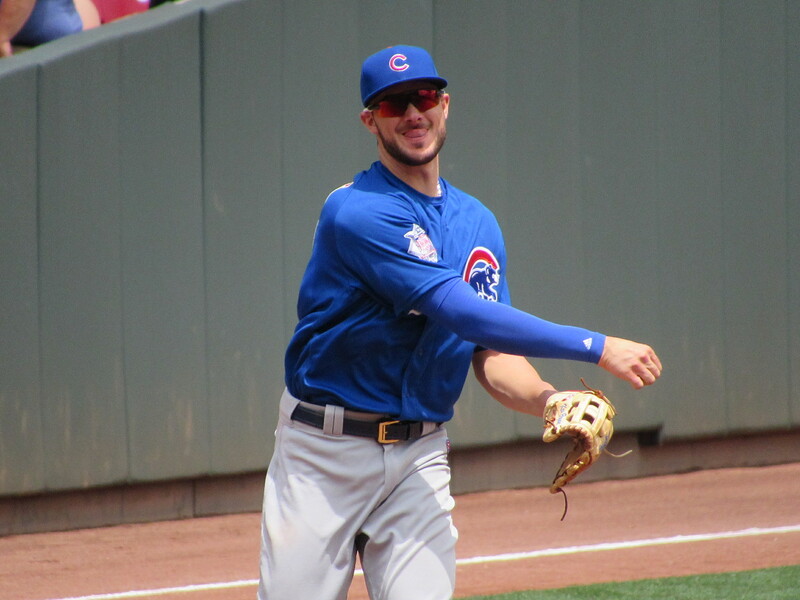 We were worried after 15 innings of play last night that he might not play today. 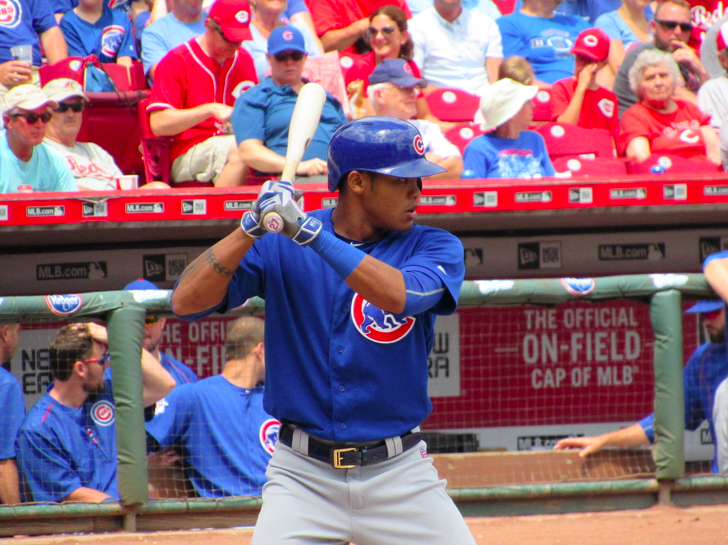 He did play, collected a couple of knocks, and showed off the powerful swing. All the fellas on hand that went with me today are big, big fans of Bryant’s game. He is a helluva player. 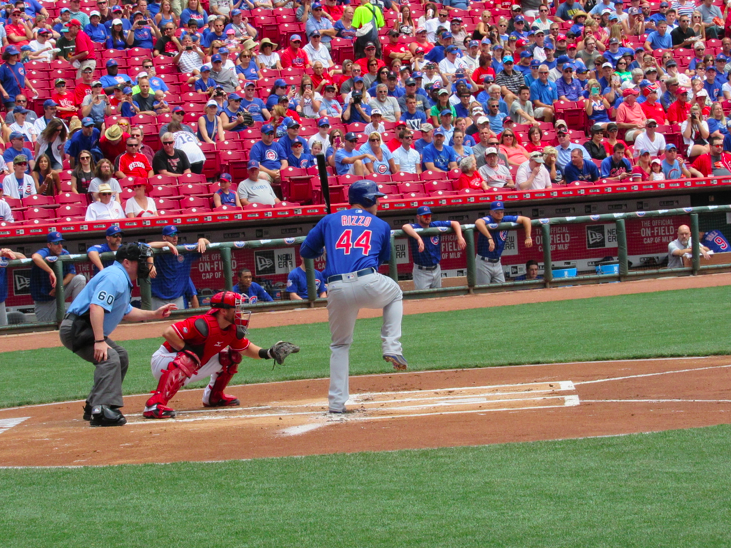 Here’s Anthony Rizzo’s first swing of the day…..
And it resulted in an inside the park home run that put the Cubs up 3-0 to open scoring. I had a picture of him sliding into home perfectly timed; but my buddy T.J. put his hand in front of my camera. 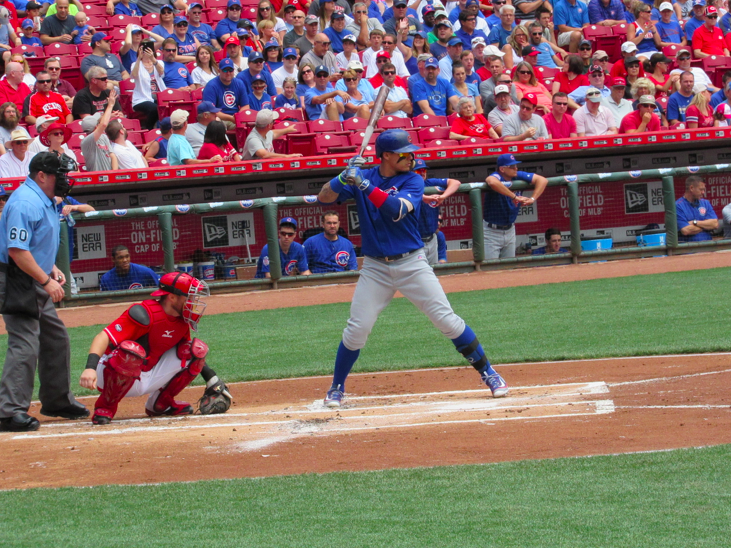 Billy Hamilton took a baseball off the head (off Adam Duvall’s glove) which knocked him out of the game and resulted in the Rizzo inside the park home run. 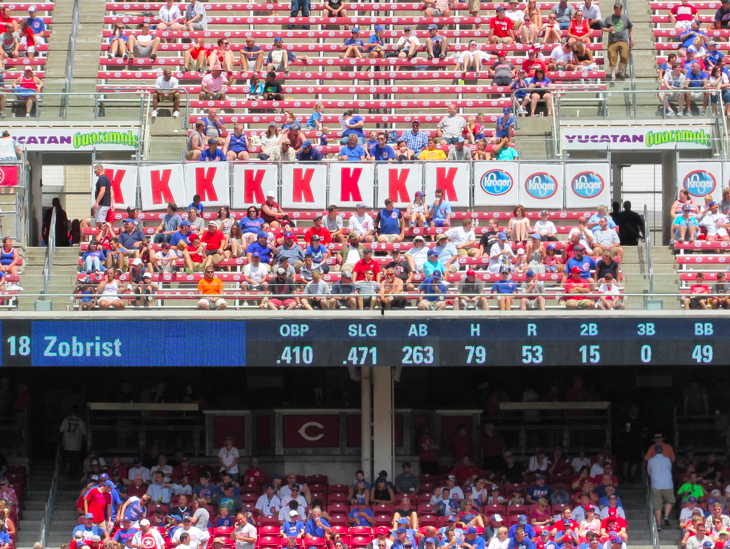 Reds fans got free Larosa’s Pizza (good tomorrow with your ticket stub) for Cody Reed and the moribund bullpen striking out ten hitters. This was taken before the highlight of the day 10th K took place. 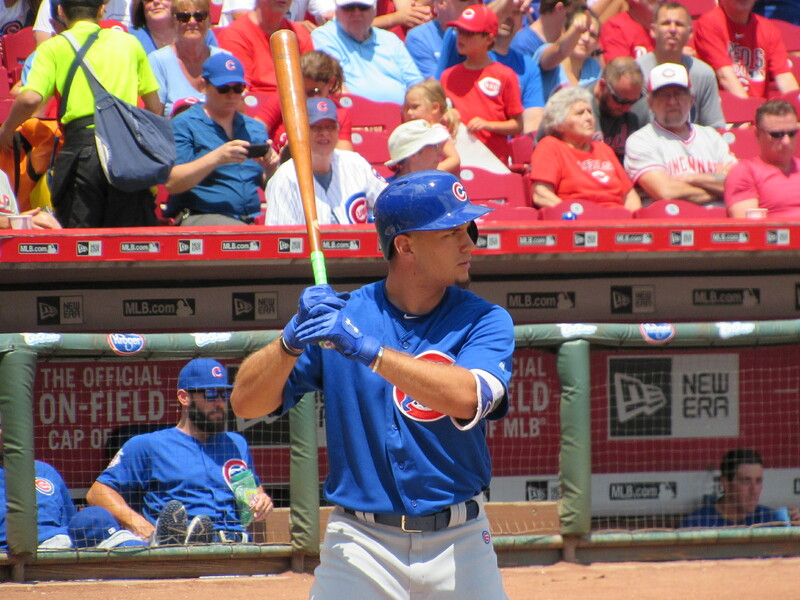 Javier Baez had himself a day. A couple knocks, a stolen base, a nice hustle play in the field to start a double play. He’s a really valuable little toy for Joe Maddon. Here’s Wilson Contreras, who has taken on the role of 2016 Kyle Schwarber. He had a run scoring double early in the game. He’s built like an outfielder physically. 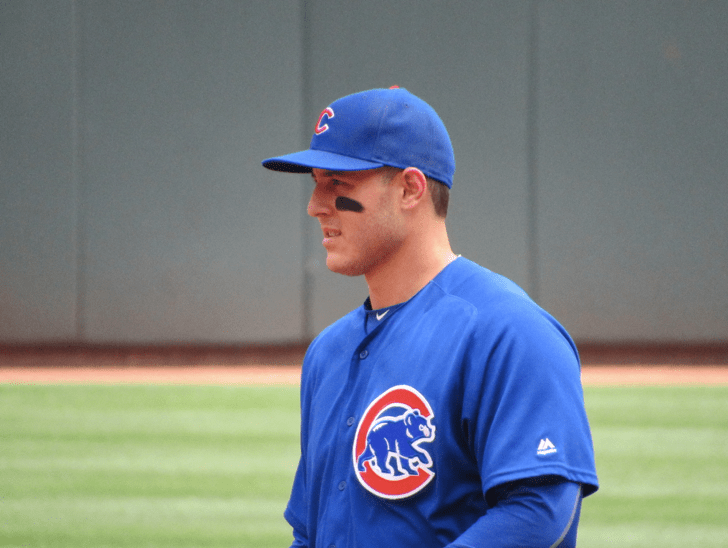 Anthony Rizzo, a good Italian boy. 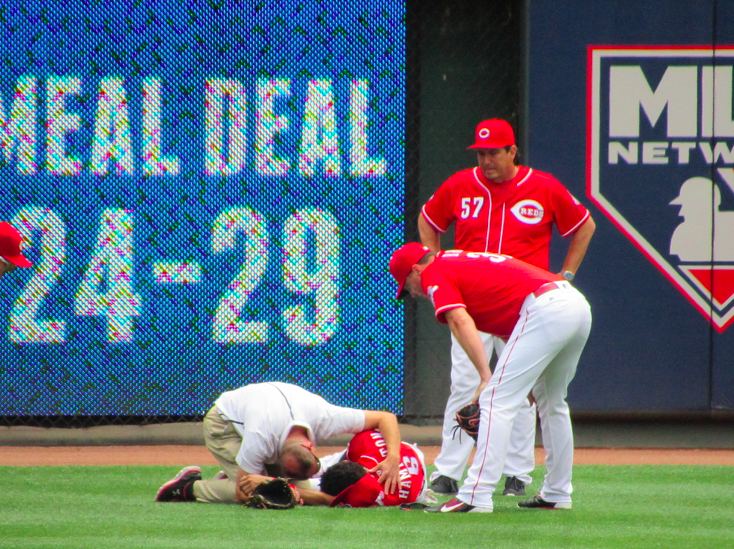 Was this my farewell to Jay Bruce? I think it probably was. 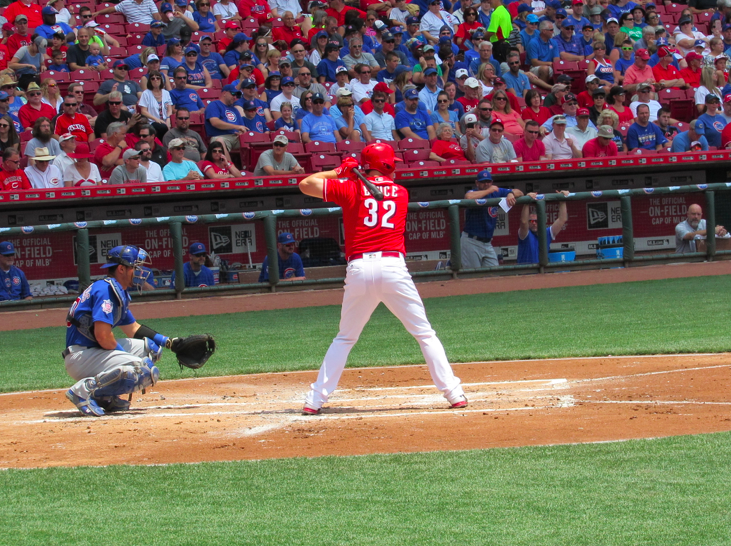 I have seen Jay Bruce play so many games in his career live. It’s been awesome. He had a couple knocks today, and in the last at bat that I saw him in a Reds uniform he ripped a double over the head of the right fielder. 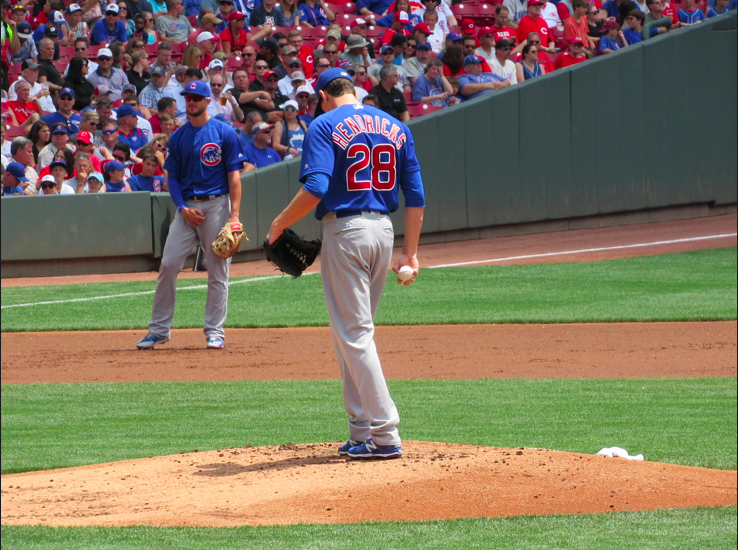 Kyle Hendricks seemed to lack a put-away pitch all afternoon but still improved to 6-6 on the season. 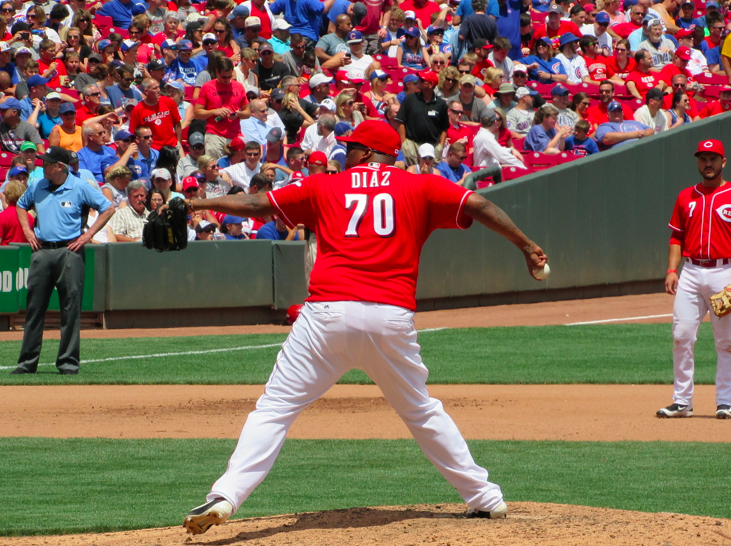 Jumbo Diaz sighting. You can’t rid yourself of Jumbo Diaz. 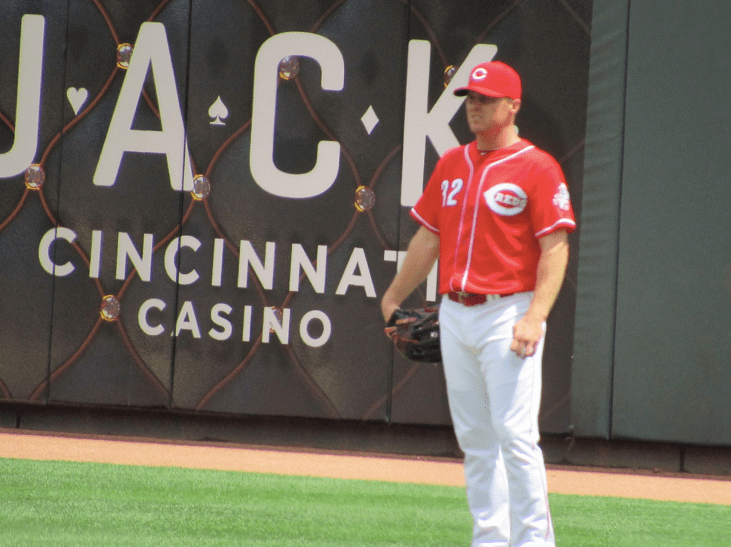 The last glimpse of Jay bruce in a Reds’ uniform? One of my favorite shots of the day. 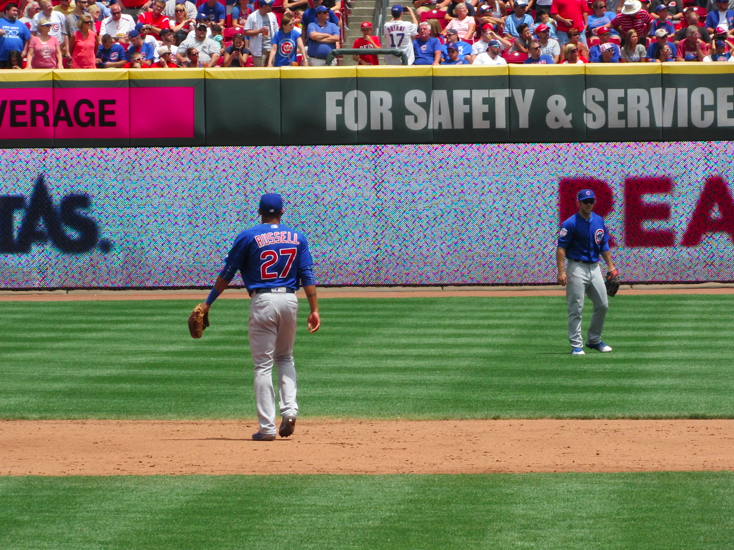 My new camera is so solid I got Joe Maddon spitting seeds! Look at that detail folks! 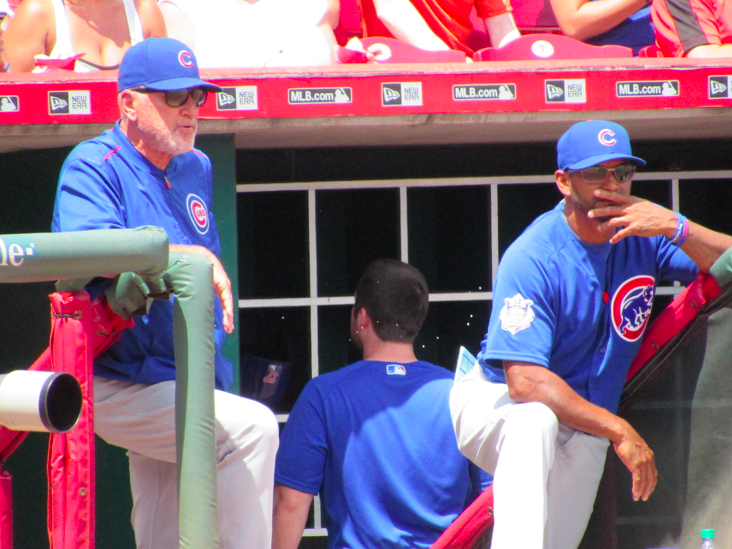 Next to him is Dave Martinez. Right field in this park just looks so much different than it did when I started going to this park. It’s really evolved over the years. 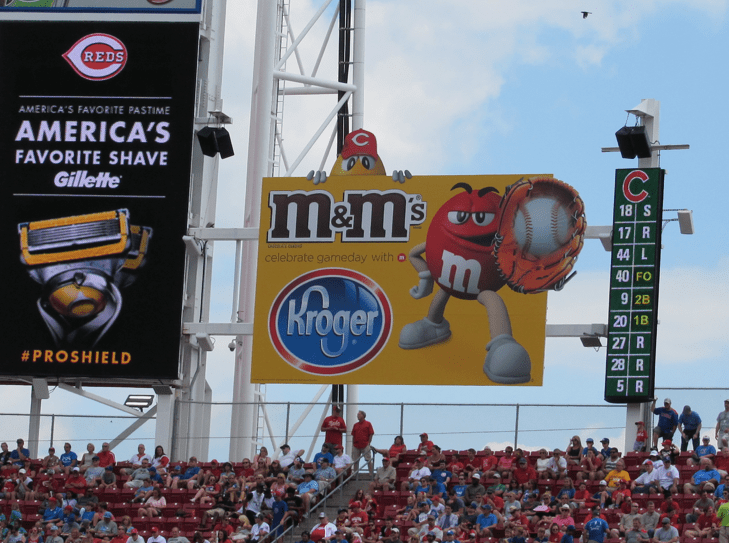 The M&M’s sign is kind of cool. 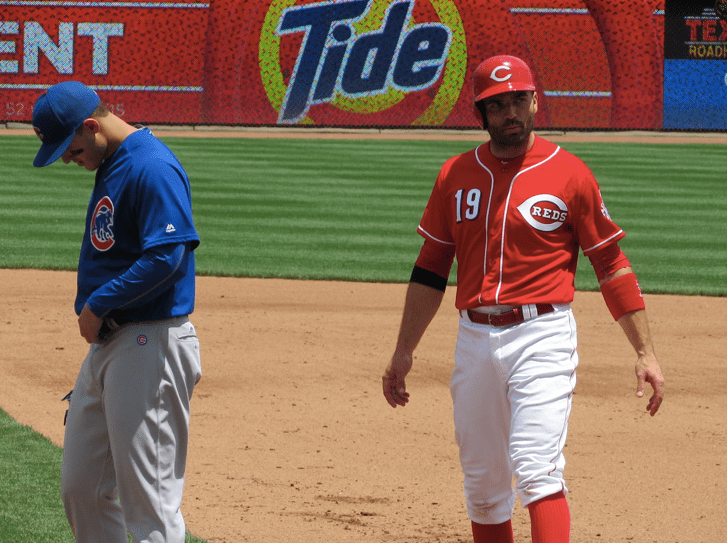 Joey Votto reaching first and getting ready to exchange pleasantries with Anthony Rizzo.